Photograph, Portrait of Oliver Loving. Image available on the Internet and included in accordance with Title 17 U.S.C. Section 107. LOVING, OLIVER (1812–1867). Oliver Loving, cattle driver, son of Joseph and Susannah Mary (Bourland) Loving, was born in Hopkins County, Kentucky, on December 4, 1812. On January 12, 1833, he married Susan Doggett Morgan, and for the next ten years he farmed in Muhlenberg County, Kentucky. The Lovings became the parents of nine children, four of whom were born in Texas. In 1843 Loving and his brother and brother-in-law moved their families to Texas. In the Peters colony, Loving received 639.3 acres of land in three patents and counties—Collin, Dallas, and Parker. The family stopped for a year in Lamar County and had settled in Collin County before 1850. Loving farmed and, to feed his growing family, hauled freight. By 1855 the Lovings had moved to the future Palo Pinto County, where they ran a country store near Keechi Creek and ranched. The first assessment roll of Palo Pinto County, taken in 1857, listed Loving with 1,000 acres of land. To market his large herd, Loving drove them out of Texas. In 1857 he entrusted his nineteen-year-old son, William, to drive his and his neighbors' cattle to Illinois up the Shawnee Trail. The drive made a profit of thirty-six dollars a head and encouraged Loving to repeat the trek successfully the next year with John Durkee. The Goodnight-Loving Trail. Image available on the Internet and included in accordance with Title 17 U.S.C. Section 107. On August 29, 1860, Loving and John Dawson started a herd of 1,500 toward Denver to feed the gold miners. They crossed the Red River, met the Arkansas, and followed it to Pueblo, Colorado, where the cattle wintered. In the spring Loving sold his cattle for gold and tried to leave for Texas. Since the Civil War had broken out, the Union authorities prevented him from returning to the South until Kit (Christopher) Carson and Lucien Maxwell interceded for him. During the war Loving was commissioned to drive cattle to Confederate forces along the Mississippi. When the war ended, the Confederate government reportedly owed him between $100,000 and $250,000. To make matters worse, the usual cattle markets were inadequate for the available supply. In 1866, having heard about the probable need for cattle at Fort Sumner, New Mexico, where some 8,000 Indians had been settled on a reservation, Loving gathered a herd, combined it with that of Charles Goodnight, and began a long drive to the fort. Their route later became known as the Goodnight-Loving Trail, although it had been used by other cattlemen. The trail followed the path of the Butterfield Overland Mail to the future site of Fort Concho and turned north at the Pecos, leading to Fort Sumner and on to Denver. The two cattlemen sold beef to the army for $12,000 in gold. Loving drove the stock cattle on to Colorado and sold them near Denver, while Goodnight returned to Weatherford, Texas, with the gold and for a second herd. The two men were reunited in southern New Mexico, where they established a ranch at Bosque Grande, about forty miles south of Fort Sumner. They spent the winter of 1866–67 there and supplied cattle from the ranch to Fort Sumner and Santa Fe. 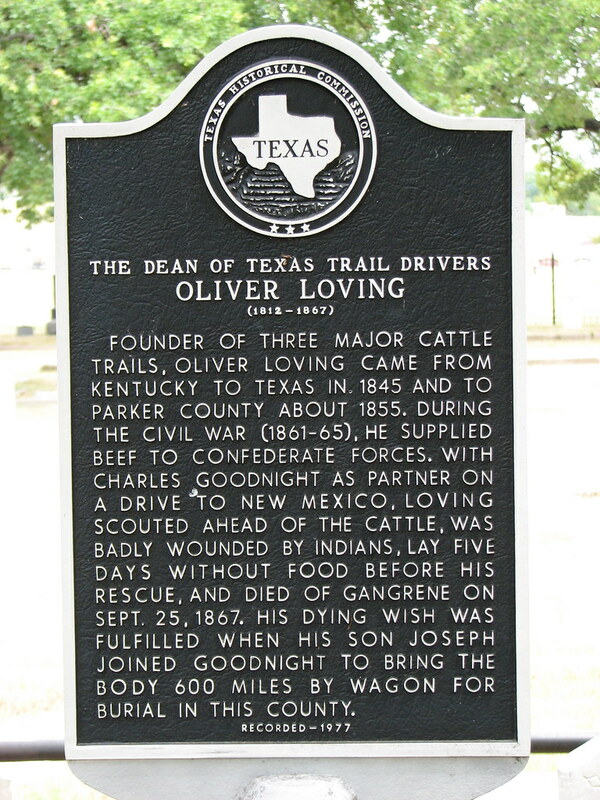 Photograph, Historical marker for Oliver Loving. Image available on the Internet and included in accordance with Title 17 U.S.C. Section 107. In the spring of 1867 Loving and Goodnight returned to Texas, ready to start a new drive. The third drive was slowed by heavy rains and Indian threats. Loving went ahead of the herd for contract bidding. He took only Bill Wilson, a trusted scout, with him. Although he told Goodnight that he would travel at night through Indian country, Loving became impatient and pushed ahead during the day. His careless action brought an Indian attack in which he was seriously wounded. The weakened Loving sent Wilson back to the herd, eluded the Indians, and with the aid of Mexican traders reached Fort Sumner, only to die there of gangrene on September 25, 1867. Before Loving died Goodnight assured him that his wish to be buried in Texas would be carried out. After a temporary burial at Fort Sumner, while Goodnight drove the herd on to Colorado, Goodnight had Loving's body exhumed and carried home. Stories differ as to who accompanied the body back to Weatherford, but he was reburied there in Greenwood Cemetery on March 4, 1868, with Masonic honors. Loving has been inducted into the National Cowboy Hall of Fame in Oklahoma City. Loving County, Texas, and Loving, New Mexico, are named in his honor. Seymour V. Connor, The Peters Colony of Texas: A History and Biographical Sketches of the Early Settlers (Austin: Texas State Historical Association, 1959). Wayne Gard, "The Shawnee Trail," Southwestern Historical Quarterly 56 (January 1953). J. Evetts Haley, Charles Goodnight (Boston: Houghton Mifflin, 1936; new ed., Norman: University of Oklahoma Press, 1949). J. Marvin Hunter, Trail Drivers of Texas (2 vols., San Antonio: Jackson Printing, 1920, 1923; 4th ed., Austin: University of Texas Press, 1985). Joseph G. McCoy, Historic Sketches of the Cattle Trade of the West and Southwest (Kansas City, Missouri: Ramsey, Millett, and Hudson, 1874; rpt., Philadelphia: Porcupine, 1974). Handbook of Texas Online, Julia Cauble Smith, "LOVING, OLIVER," accessed April 24, 2019, http://www.tshaonline.org/handbook/online/articles/flo38.